By now, everyone who has access to cable television, internet, or carrier pigeon knows that the Dow Jones Industrial Average (INDU) reached a new all-time-high earlier this week. I always enjoy anecdotal market sentiment indicators, so the following is presented as Case in Point #1: yesterday, the mother of one of my daughter's school friends took time out from her busy schedule of watching her dog attack the postman (that's another story though) to send me a text message about the Dow reaching a new high. Now, keep in mind this is not someone who would be lauded for her investment savvy -- in fact, the reason she texted me (I assume) was as follow-up to a conversation we'd had over the weekend, wherein she confided to me that she had sold all of her stock in 2009, almost-exactly at the bottom. The gist of her message was: She's thinking about getting back into the market now. While INDU reached a new all-time high, and SPX has breached its February high, certain other indices are still flirting with their February highs. The Russell 2000 (RUT) and NYSE Composite (NYA) come to mind. The NYA chart below is interesting to me, because classic technical analysis looks at this chart and sees the potential of a double-top. 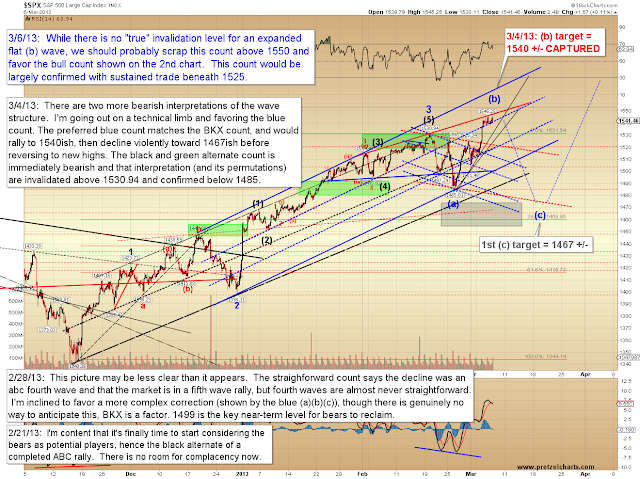 I see that potential as well, but because I'm a practitioner of Elliott Wave Theory, I also look at some additional info here. When I study the wave structure of the rally from 8700, it appears to me to be a three-wave form -- and that suggests to me that even if the double-top did play out, it is quite likely that the next decline will only be corrective, and ultimately be fully retraced to even higher highs. Long-time readers will recall that a similar pattern in the INDU back in October 2012 largely kept me in expectation of new highs after the November lows. The annotation on the chart explains the rest. Building on that concept, I am still watching two near-term potentials in the S&P 500 (SPX). While I've labeled them as "bull and bear" counts, they both project that the market will ultimately exceed current levels -- it's more a question of now or later. 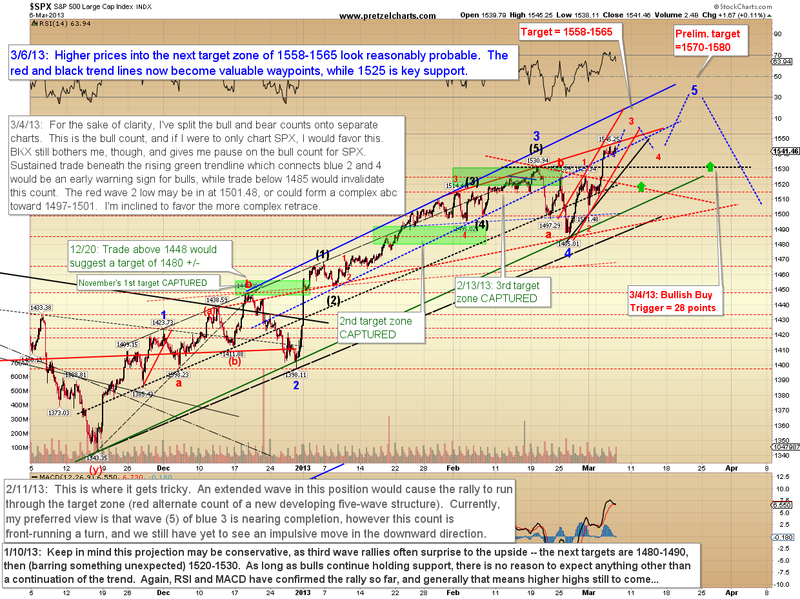 In other words, in my current estimation, the next major inflection point appears to be lurking in the 1560-1580 zone and I expect that zone to be reached, but there are two likely paths the market may take to get there. 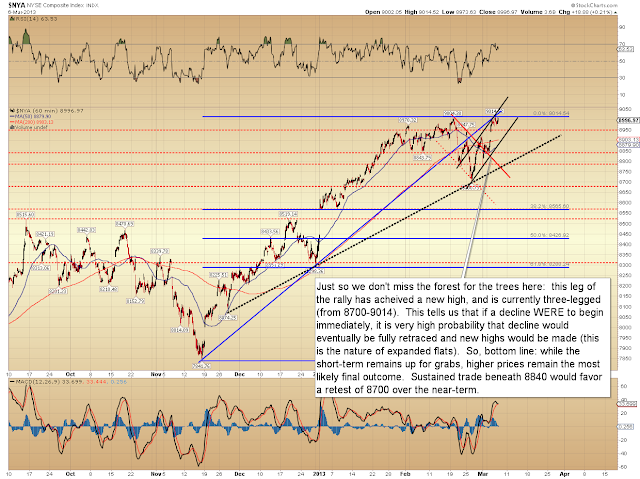 One possibility is the expanded flat referenced on the NYA chart above, and detailed in the SPX chart below. One thing I like about that count, as it relates to the total market and some of the indices like NYA and RUT, is it allows for some singificant selling to come in as the other indices test their February highs. However, something I do not like about this count is the momentum of the current move, which has been impressive, and may not turn on a dime. I also have the impression that a lot of bears took their shot in the 1525 zone, and those shorts might not unwind as quickly as this count would require. Fortunately, we should have our answer quite soon in terms of price -- the more immediately bullish count is shown on the second chart which follows, and the key upside level which divides the two wave counts is 1550. 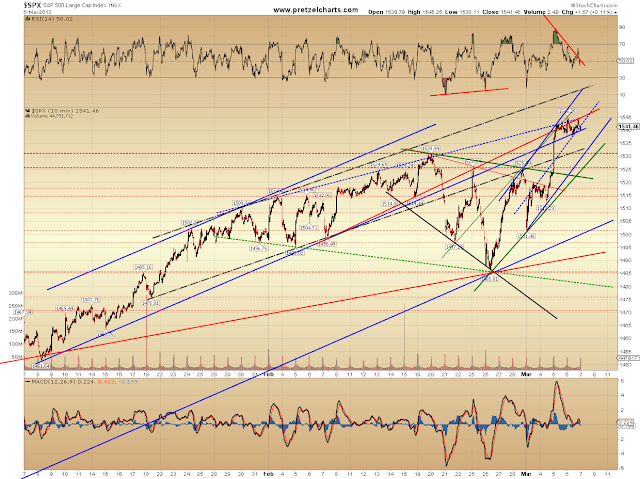 In the event of a solid breach of 1550, the count shown below will become the favored outlook. 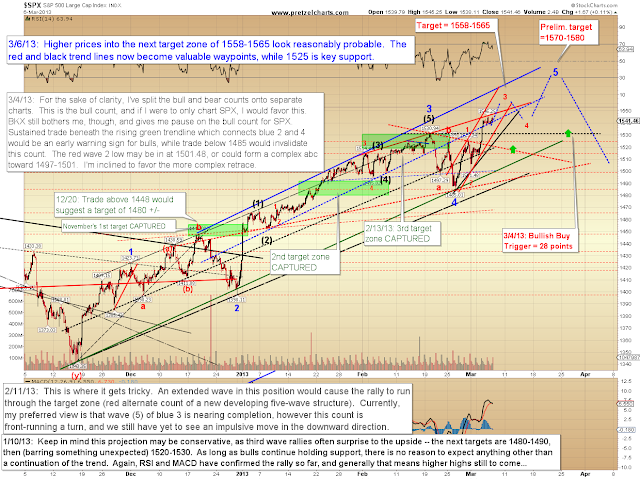 Note the potential of a larger corrective turn once the current rally wave is complete; we'll have to watch this structure closely as this leg unravels. I'd also like to add that the Philadelphia Bank Index is still below its February high of 55.85, though just barely. 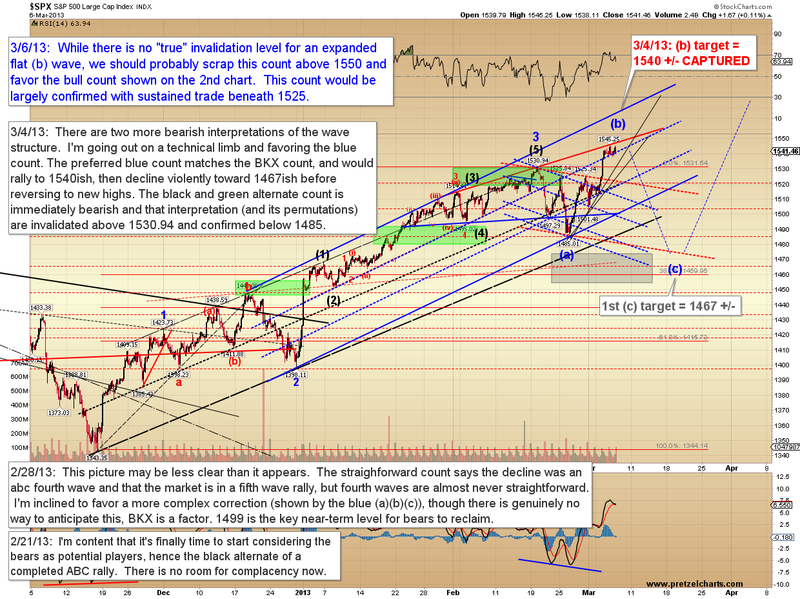 Sustained trade above that high would further suggest the more immediately near-term bullish count for SPX. In conclusion, the market still has two reasonable options for the short-term, but presently my work continues to suggest higher prices will be reached before the next potentially important turning point presents itself, likely in the 1560-1580 zone. Trade safe.